I wondered if this was either some sort of an inside joke, a serious attempt at art or was it simply someone going off the deep end here. 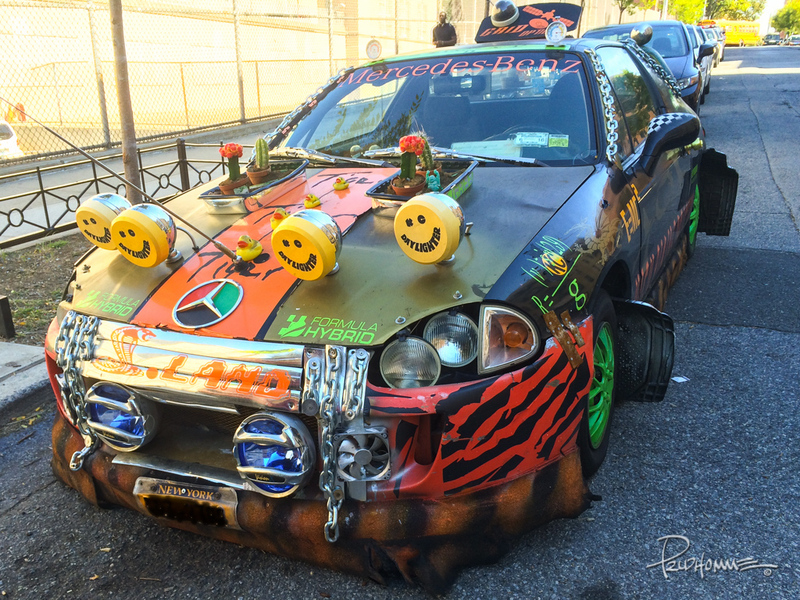 I was walking to a particular school in the Bronx one day when I beheld a most atrocious and yet highly intriguing oddity parked on the street. 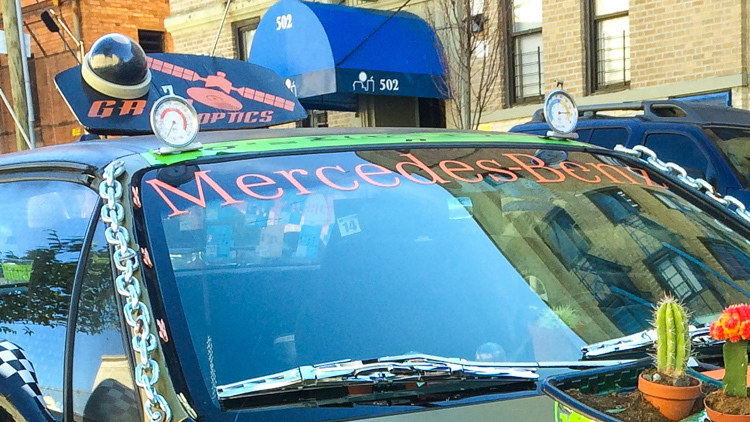 The car, if you can call it that, was a modified Mercedes Benz. I stood stupefied and slack-jawed. People were walking by as it was nothing new to look at. I was the only one scratching my head on that street. I had to take a moment to fully digest what I was seeing. I was in a rush but I just HAD to slowly walk around it, marveling at the owner’s brass cojones – or his mad genius qualities. It kinda grows on you, no? I wondered if this was either some sort of an inside joke, a serious attempt at art or was it simply someone going off the deep end here. The more I looked at it, the more I started to smile and then appreciated the owner’s eccentricity and bold statement. I was already self-conscious that I was taking a little too long gawking at it and snapping away with my iPhone like some weirded out customer at a freak show attraction. Whoever the owner is, he obviously put a lot of work into this street side exhibit. 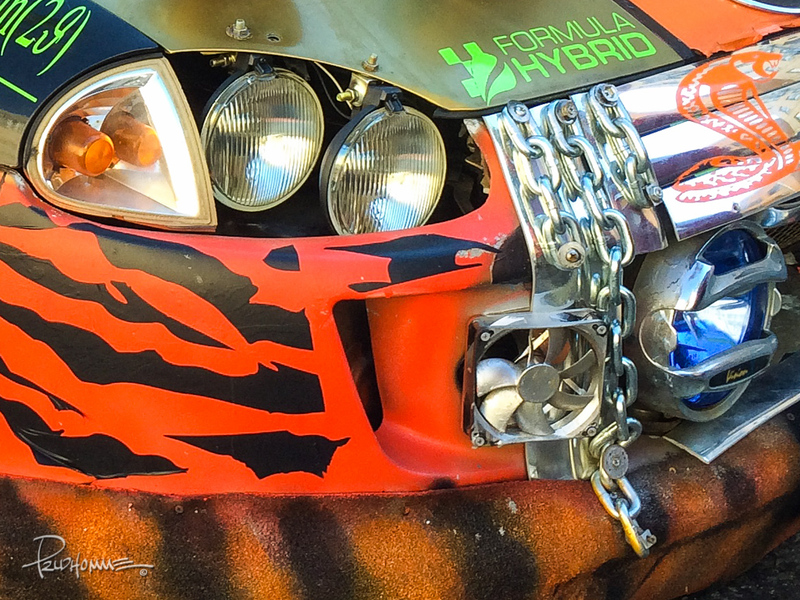 If you look closely, you see various odds and ends affixed to the car: chains, mathematical equation decals, extra lights, garish colors and some sort of orange and black skirt all around the car. 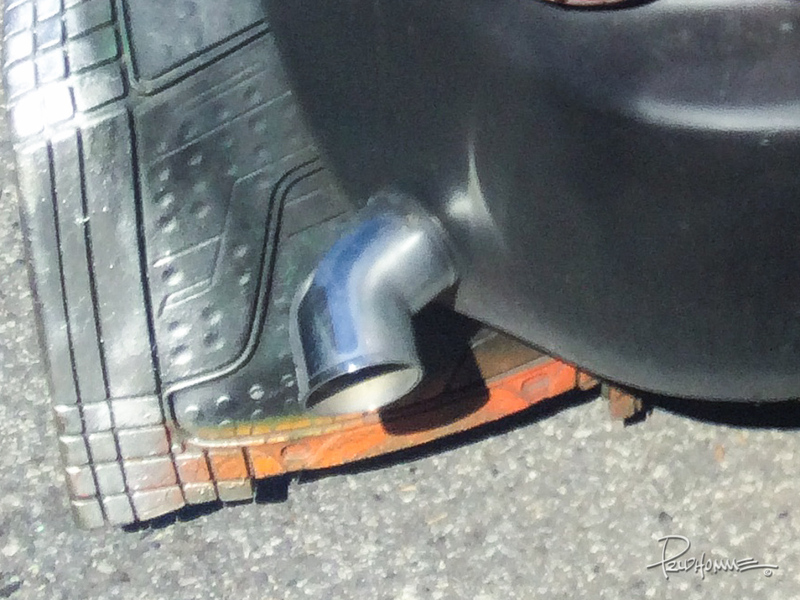 This exhaust is coming from the SIDE of the rear bumper. 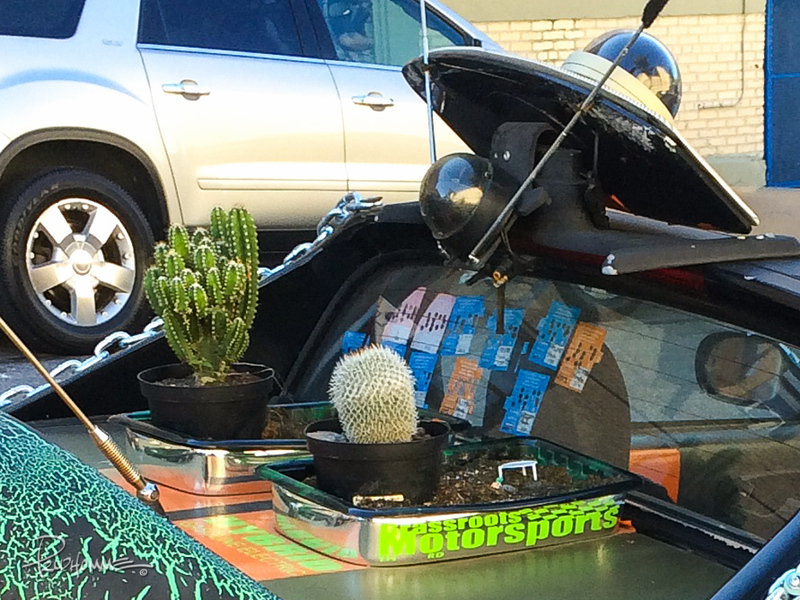 The man has cacti on the hood… CACTI! The original headlights were removed and replaced with other headlights? Is that a mini-fan up in the front? 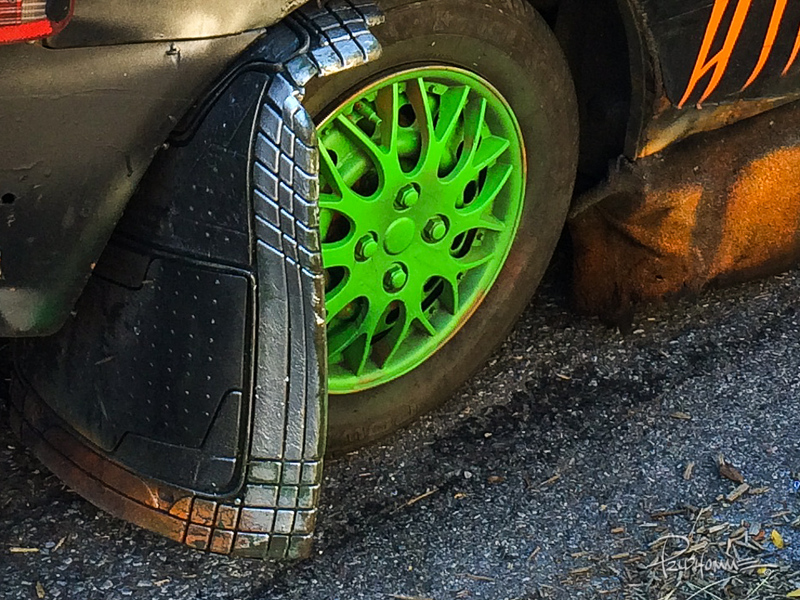 Buying real mud flaps would’ve been too easy and stupid. Instead he uses interior car mats! Okay. I noticed this just the other day: a power strip and outlets. For WHAT? 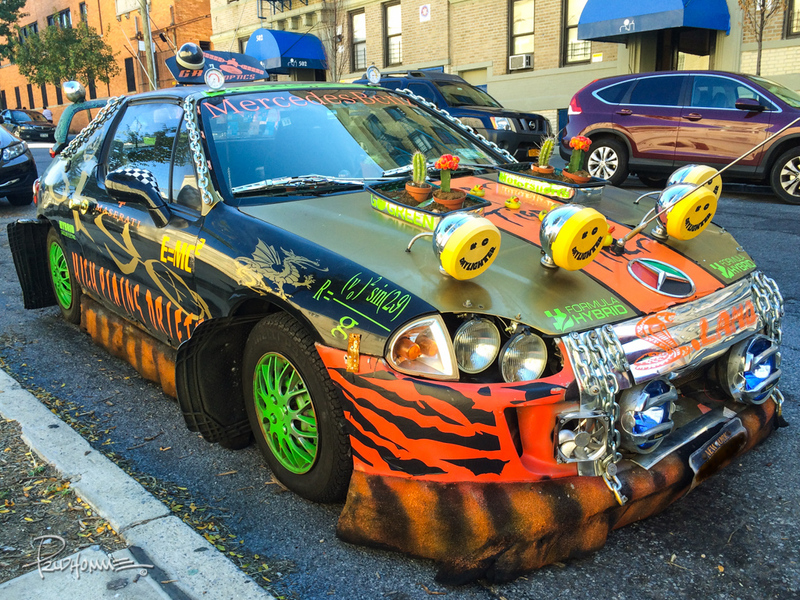 Besides more plant life on this thing, it appears that he placed two cameras on the hood along with lots of old school retractable radio antennas. 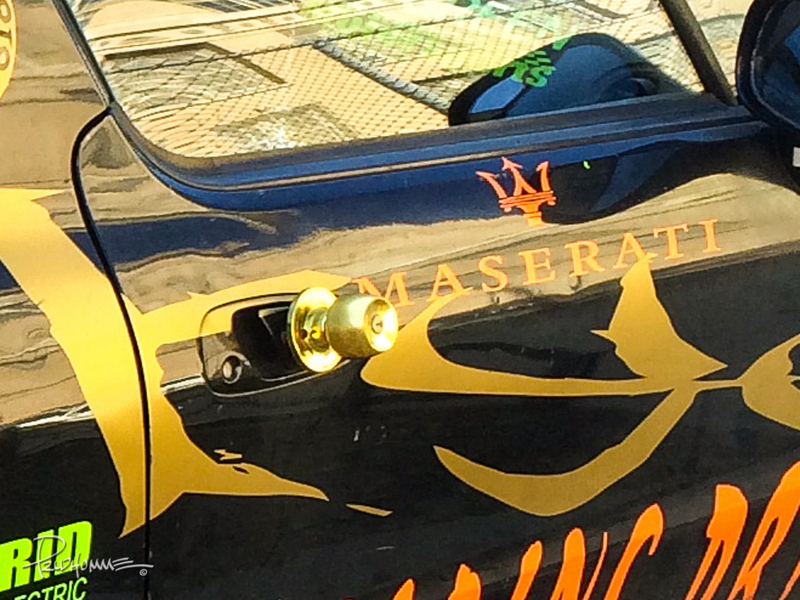 A DOOR KNOB replaced the car’s door handle! Is that a radar dish? What’s up with the two gauges? What the heck, I give up! 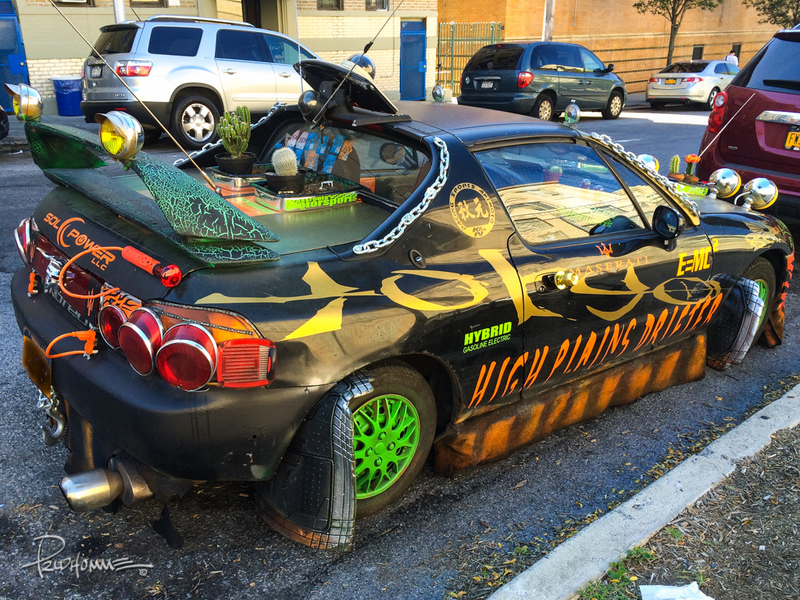 I can only imagine was the inside of this car looks like. I didn’t have the presence of mind to peer inside and take pictures. I was already self-conscious that I was taking a little too long gawking at it and snapping away with my iPhone like some weirded out customer at a freak show attraction. You just don’t want to get caught staring too long at it – but I couldn’t help it! I returned to this same place several weeks later and this Franken-Benz was still parked in the same exact spot, almost as it was never moved or ticketed. All the various parts were still in place and the car was untouched as if it was a permanent beautiful fixture of the community. 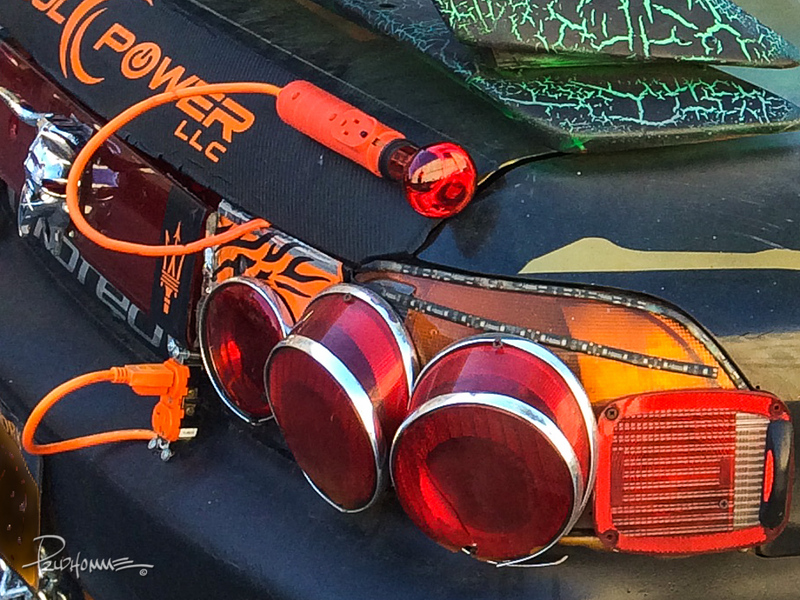 You think he has enough lights? 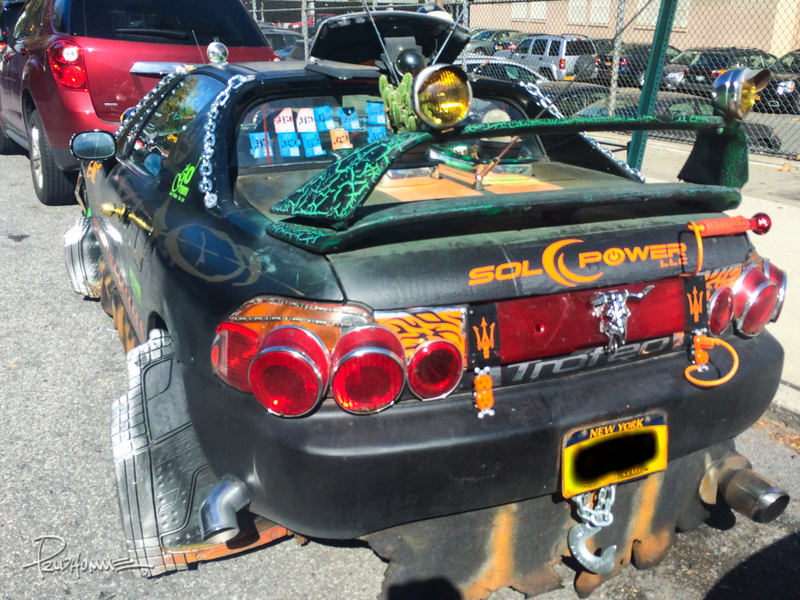 Like right ON the spoiler? Whoah. I literally just noticed TWO spoilers! Weeks after leaving the scene of the crime and looking at the photos I had taken, I am able to see something new I had not seen before. 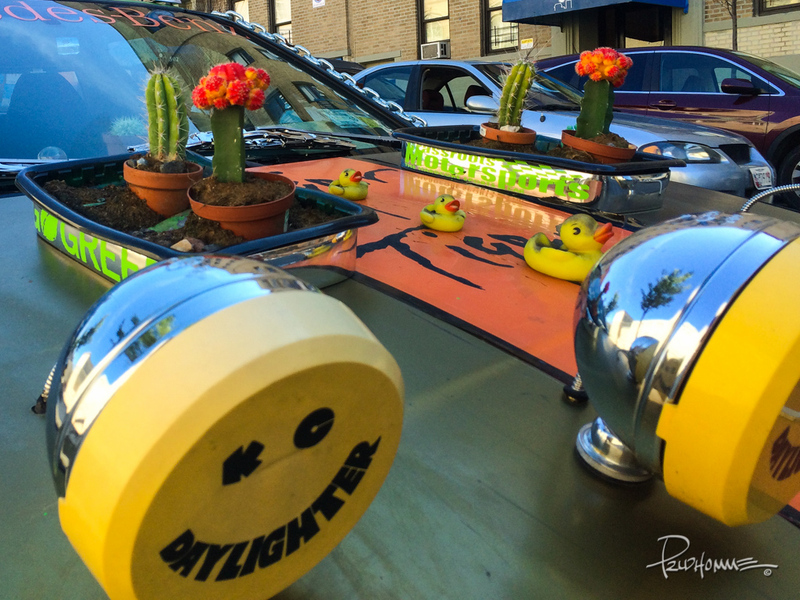 It’s the little touches – like the rubber duckies on the hood – that still get me. I smile whenever I glance at these pictures. I actually like car now and can better appreciate what the owner was trying to do. Perhaps he wanted to create something new and unique, illiciting conversation in the process? Is he an artist? Provocateur? Or simply bonkers? One thing for sure, he doesn’t give a damn what any of us think about his creation. I can admire and respect that. Unless you t9ld us it was a Merc I would never have guessed it. Im all for individual taste but i recon the owners 5 year old son customised it!